The 100 wirewound precision resistor series from Riedon offers resistance values between 700kΩ and 1MΩ (lower resistances available upon request) at power rating of 0.2W, tolerances as low as ±0.005% and a standard TCR of ±10ppm/°C (wide TCR range, including Balco & Platinum wire for high TCR, available upon request). These resistors use a traditional design for through-hole circuit board mounting, while offering number of custom features. The 100 series resistors are all 100% acceptance tested and traceable to NIST, and offer long term stability of 100ppm/year (20ppm/year version available). 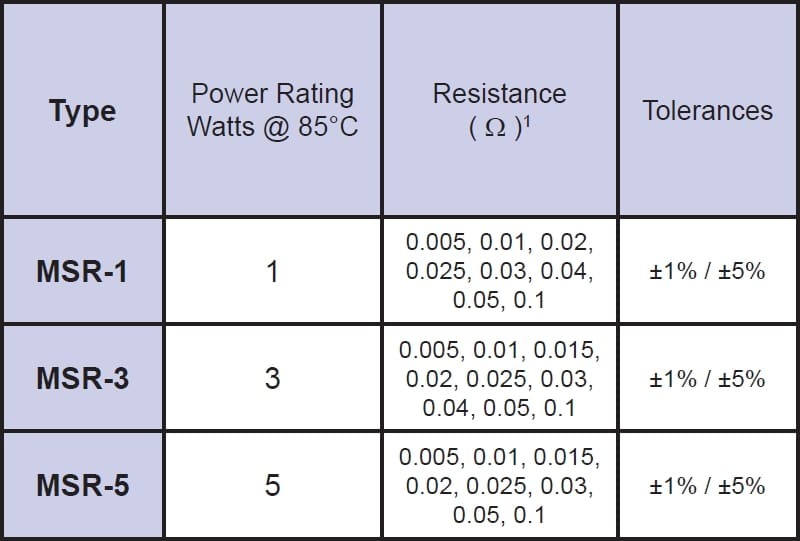 Matched resistance sets to ±0.001% and ±0.5ppm/°C are also available. The 101 wirewound precision resistor series from Riedon offers resistance values between 700kΩ and 1.2MΩ (lower resistances available upon request) at power rating of 0.25W, tolerances as low as ±0.005% and a standard TCR of ±10ppm/°C (wide TCR range, including Balco & Platinum wire for high TCR, available upon request). These resistors utilise a traditional design for through-hole circuit board mounting, while offering number of custom features. The 101 series resistors are all 100% acceptance tested and traceable to NIST, and offer long term stability of 100ppm/year (20ppm/year version available). Matched resistance sets to ±0.001% and ±0.5ppm/°C are also available. The 102 wirewound precision resistor series from Riedon offers resistance values between 700kΩ and 2.5MΩ (lower resistances available upon request) at power rating of 0.33W, tolerances as low as ±0.005% and a standard TCR of ±10ppm/°C (wide TCR range, including Balco & Platinum wire for high TCR, available upon request). These resistors utilise a traditional design for through-hole circuit board mounting, while offering number of custom features. The 102 series resistors are all 100% acceptance tested and traceable to NIST, and offer long term stability of 100ppm/year (20ppm/year version available). Matched resistance sets to ±0.001% and ±0.5ppm/°C are also available. The 104PC wirewound precision resistor series from Riedon offers resistance values between 700kΩ and 1MΩ (lower resistances available upon request) at power rating of 0.5W, tolerances as low as ±0.005% and a standard TCR of ±10ppm/°C (wide TCR range, including Balco and Platinum wire for high TCR, available upon request). These resistors utilise a traditional design for through-hole circuit board mounting, while offering number of custom features. The 104PC series resistors are all 100% acceptance tested and traceable to NIST, and offer long term stability of 100ppm/year (20ppm/year version available). Matched resistance sets to ±0.001% and ±0.5ppm/°C are also available. The 106 wirewound precision resistor series from Riedon offers resistance values between 700kΩ and 6MΩ (lower resistances available upon request) at power rating of 1W, tolerances as low as ±0.005% and a standard TCR of ±10ppm/°C (wide TCR range, including Balco & Platinum wire for high TCR, available upon request). These resistors utilise a traditional design for through-hole circuit board mounting, while offering number of custom features. The 106 series resistors are all 100% acceptance tested and traceable to NIST, and offer long term stability of 100ppm/year (20ppm/year version available). Matched resistance sets to ±0.001% and ±0.5ppm/°C are also available. 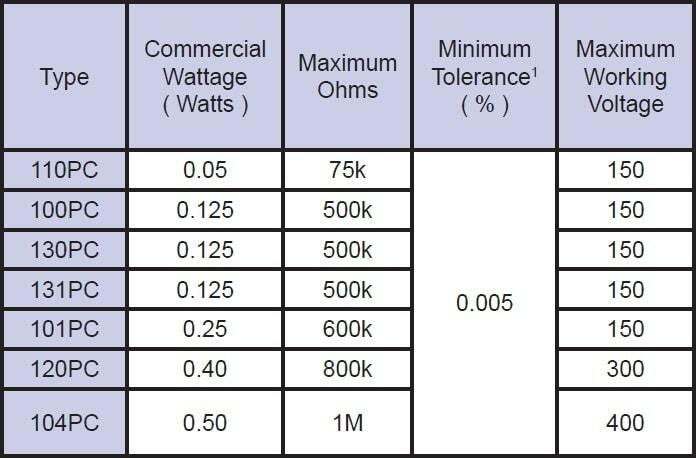 The 107 wirewound precision resistor series from Riedon offers resistance values between 700kΩ and 6MΩ (lower resistances available upon request) at power rating of 1.5W, tolerances as low as ±0.005% and a standard TCR of ±10ppm/°C (wide TCR range, including Balco and Platinum wire for high TCR, available upon request). These resistors utilise a traditional design for through-hole circuit board mounting, while offering number of custom features. The 107 series resistors are all 100% acceptance tested and traceable to NIST, and offer long term stability of 100ppm/year (20ppm/year version available). Matched resistance sets to ±0.001% and ±0.5ppm/°C are also available. The 108 wirewound precision resistor series from Riedon offers resistance values between 700kΩ and 6MΩ (lower resistances available upon request) at power rating of 2W, tolerances as low as ±0.005% and a standard TCR of ±10ppm/°C (wide TCR range, including Balco and Platinum wire for high TCR, available upon request). These resistors use a traditional design for through-hole circuit board mounting, while offering number of custom features. The 108 series resistors are all 100% acceptance tested and traceable to NIST, and offer long term stability of 100ppm/year (20ppm/year version available). Matched resistance sets to ±0.001% and ±0.5ppm/°C are also available. The 120 wirewound precision resistor series from Riedon offers resistance values between 700kΩ and 3.8MΩ (lower resistances available upon request) at power rating of 0.4W, tolerances as low as ±0.005% and a standard TCR of ±10ppm/°C (wide TCR range, including Balco & Platinum wire for high TCR, available upon request). These resistors use a traditional design for through-hole circuit board mounting, while offering number of custom features. The 120 series resistors are all 100% acceptance tested and traceable to NIST, and offer long term stability of 100ppm/year (20ppm/year version available). Matched resistance sets to ±0.001% and ±0.5ppm/°C are also available. The 120PC wirewound precision resistor series from Riedon offers resistance values between 700kΩ and 800kΩ (lower resistances available upon request) at power rating of 0.4W, tolerances as low as ±0.005% and a standard TCR of ±10ppm/°C (wide TCR range, including Balco and Platinum wire for high TCR, available upon request). These resistors use a traditional design for through-hole circuit board mounting, while offering number of custom features. The 120PC series resistors are all 100% acceptance tested and tracable to NIST, and offer long term stability of 100ppm/year (20ppm/year version available). Matched resistance sets to ±0.001% and ±0.5ppm/°C are also available. The 121 wirewound precision resistor series from Riedon offers resistance values between 700kΩ up to 3.8MΩ (lower resistances available upon request) at power rating of 0.5W, tolerances as low as ±0.005% and a standard TCR of ±10ppm/°C (wide TCR range, including Balco & Platinum wire for high TCR, available upon request). These resistors use a traditional design for through-hole circuit board mounting, while offering number of custom features. 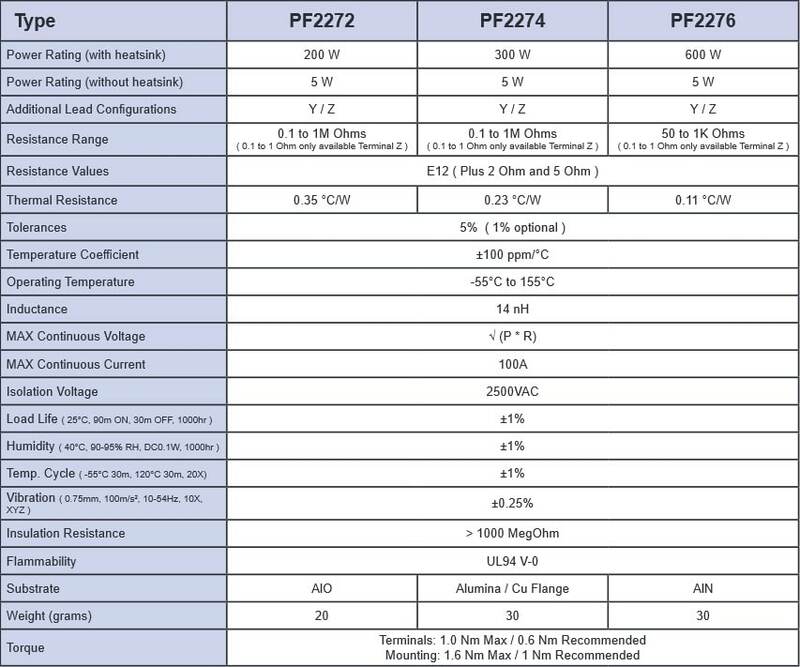 The 121 series resistors are all 100% acceptance tested and tracable to NIST, and offer long term stability of 100ppm/year (20ppm/year version available). Matched resistance sets to ±0.001% and ±0.5ppm/°C are also available. The 129 wirewound precision resistor series from Riedon offers resistance values between 700kΩ and 6MΩ (lower resistances available upon request) at power rating of 0.75W, tolerances as low as ±0.005% and a standard TCR of ±10ppm/°C (wide TCR range, including Balco & Platinum wire for high TCR, available upon request). These resistors use a traditional design for through-hole circuit board mounting, while offering number of custom features. The 129 series resistors are all 100% acceptance tested and traceable to NIST, and offer long term stability of 100ppm/year (20ppm/year version available). Matched resistance sets to ±0.001% and ±0.5ppm/°C are also available. The PF2272 non-inductive, power thick film resistor series from Riedon offers all E12 resistance values in the range between 0.1Ω and 1MΩ, plus 2Ω and 5Ω, with a power rating of 200W. 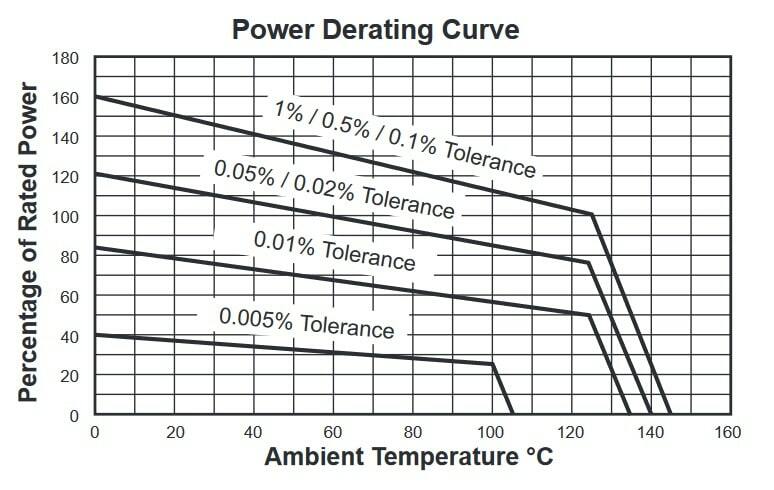 They offer a standard tolerance of 5%, with 1% available upon request, and TCR as low as 100ppm/°C. The PF2272 power film resistors come in standard TO-227 housing with an isolated back plate and M4x5mm screws included, and are available in three different terminal configurations. 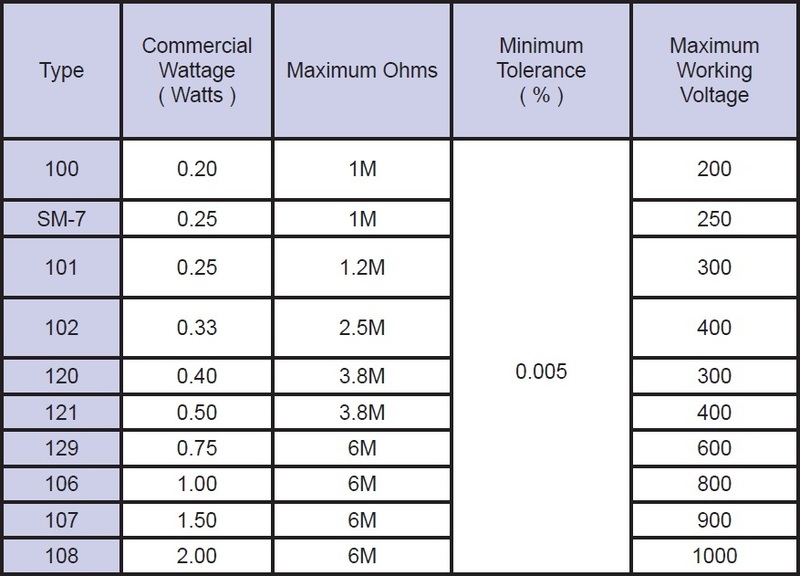 They require mounting on a suitable heat sink (please see the datasheet for calculations).